Coventry Rugby’s Championship Cup campaign ended at the quarter-final stage with a 27-17 defeat against top-of-the-table London Irish at the Madejski Stadium. Having taken an early lead through Andy Bulumakau’s interception try, the visitors trailed 17-7 at the break after home forwards Harry Elrington and Barney Maddison claimed a try apiece. And although the second half was shared – with Ben Nutley responding to home winger Ben Loader’s earlier score – it was the Exiles who progress to the last four of this new competition. 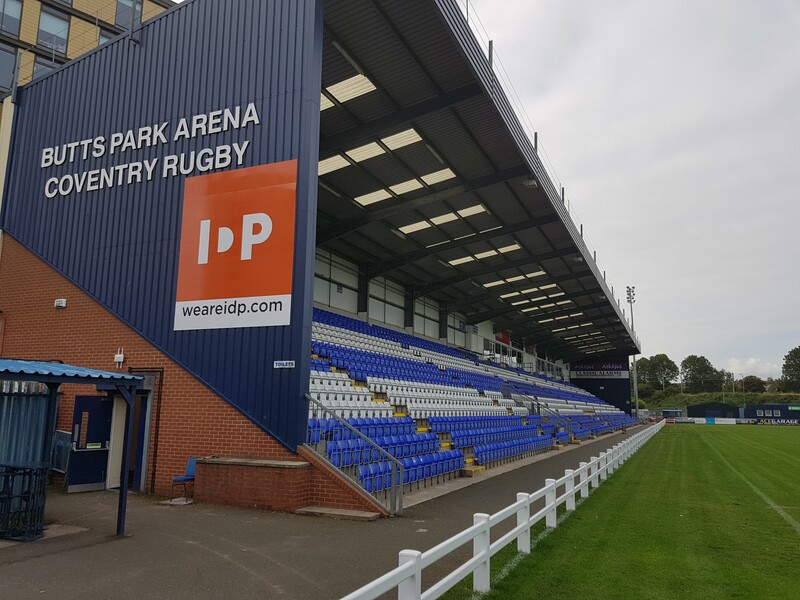 This leaves the league as the Blue-and-Whites’ sole focus, with Hartpury’s visit to the Butts Park Arena in six days’ time next on the agenda. Cov jumped into a seven-point advantage when Andy Bulumakau ended a threatening Irish attack by intercepting on halfway then coasting 55 metres to claim a try which Will Maisey upgraded. However, the visitors’ advantage was short-lived since the hosts put successive penalties into the Cov 22 then drove prop Elrington over from a lineout peel for a try which Jacob Atkins converted. And the home No.10 was on the mark again at the end of the opening quarter after home skipper Maddison forced his way over following a sequence of strong forward carries. Cov thought they were back on terms when Nutley won the race to Andy Bulumakau’s chip only for the touch judge to rule he had a foot on the touch-in-goal line prior to grounding. Irish’s front row was causing the visitors some problems but the away side looked threatening whenever the ball went wide on a superb Madejski surface, so as a result a well-balanced contest developed. Veteran home No.8 Ofisa Treviranus was prominent with ball in hand throughout the opening 40 minutes, and he was twice involved in the move which ended with his team forcing a penalty on the Cov 22 which Atkins translated into three points. This left the visitors facing a 10-point interval deficit which they reduced by three when Maisey slotted a 35-metre kick after Irish transgressed on the ground following Jack Ram’s powerful carry. As both sides rang the changes at the hour mark, it required some determined Cov defence to force a turnover when the hosts took possession through multiple phases in their 22. But Irish were not to be denied, and some slick handling ended with Loader taking an inside ball under the posts for a try which Atkins converted. 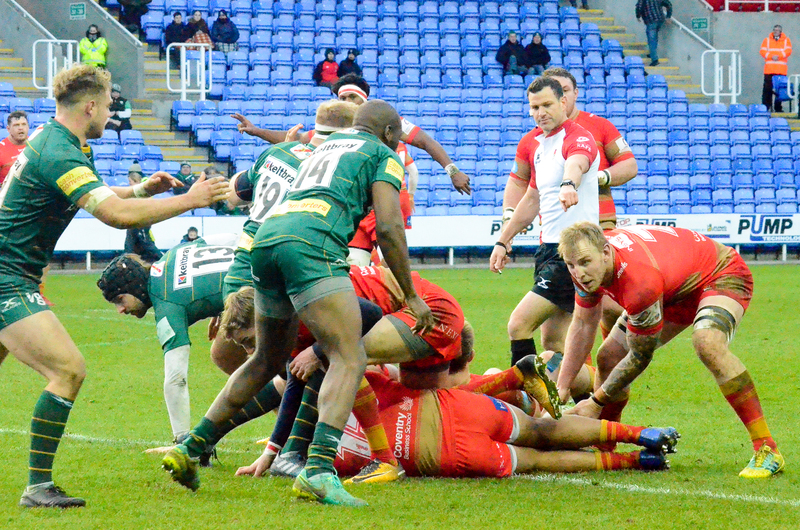 Cov went down to 14 men when Will Flinn limped off, but a superb flowing counter-attack led by Junior Bulumakau and continued by Dan Lewis went close to producing their second try only for the replacement full back’s chip to elude the lurking Rob Knox. But the visitors continued to press, and as the contest entered added time the persevering Nutley cut a fine line through midfield to race over for a well-deserved score. Maisey’s conversion brought Coventry within seven points of forcing extra time, however the visitors were immediately penalised on the ground on their own 22 which allowed Atkins to restore Irish’s cushion. It was Cov who finished strongest, when Junior Bulumakau’s pacy burst forced a sequence of penalties in the home 22 which ended with Maddison being shown a yellow card, but the hosts held on to clinch a semi-final spot. London Irish: Greig Tonks; Topsy Ojo, Tom Fowlie, Matt Williams, Ben Loader (Ollie Hassell-Collins 75); Jacob Atkins, Brendan McKibbin (Scott Steele 55); Harry Elrington (Manasa Saulo 61), Saia Fainga’a (Ollie Adams 61), Lovejoy Chawatama; Barney Maddison, Sebastian de Chaves (Conor Gilsenan 55); Max Northcote-Green (TJ loane 55), Isaac Curtis-Harris (Sam Twomey 57), Ofisa Treviranus. Coventry Rugby: David Halaifonua; Junior Bulumakau, Rob Knox, Heath Stevens, Andy Bulumakau (Dan Lewis 40); Will Maisey, Tom Kessell (Will Flinn 67); Charlie Beech (James Gibbons 61), Phil Nilsen (Scott Tolmie 52), Donald Brighouse (Phil Boulton 52); Tom Jubb (Jack Ram 56), Dan Faleafa (George Oram 3-11); Ben Adams, Ben Nutley, Adam Peters (George Oram 24). Posted in Match Reports, News and tagged Championship Cup, Coventry Rugby, london irish.